Helicopters are prototypical aircrafts that are found in contrasting varieties and compositions all over the world today. Most of them have been manufactured with larger maneuverability and are certainly one of the most popular and used aircrafts mankind has ever seen. The anatomy of helicopters is interesting and always instills a sense of thrill in the eyes of one who watches it fly. A fun way to learn about the wonderful land of aircrafts, such as helicopters is through images that capture its beauty. 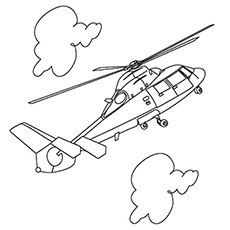 If you have a kid who loves helicopters, our collection of helicopter coloring pages printable shall surely make him or her happy! 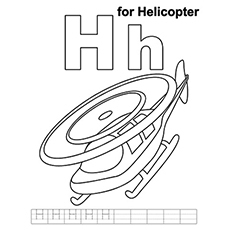 With the helicopter coloring sheets you will make your child smarter and well versed on the topic of helicopters. Here is how! This image is visually appealing and perfect for children who have just entered kindergarten. The size of the image is quite big and takes up the entire page. You can help your child learn how to shade using different colors in this one. 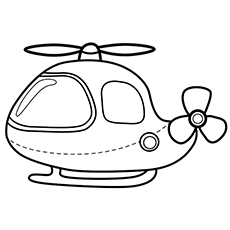 An interesting method you could use to teach your child about the anatomy of helicopters is the one in flight. Tell him about this agile aircraft and the spinning rotors it consists of, usually with two blades on top. Also tell him how versatile they are as machines and always tend to land vertically. 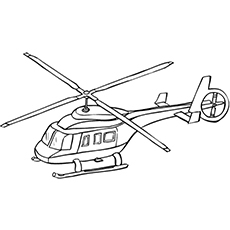 One of the most adorable and cute helicopter coloring pictures you shall ever find is this one. The image has well designed and thick borders which make coloring very easy. You may let him choose colors he likes the best for this one so that he enjoys coloring. 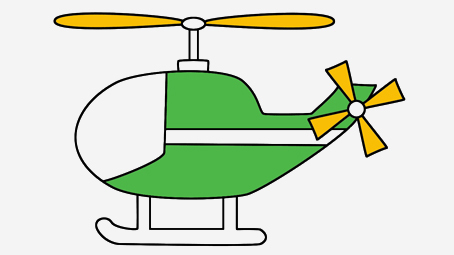 The professional helicopter has been designed exclusively for those children who have just finished kindergarten. The image has a very bold and mature touch to it. You can use the picture to tell him about the several advantages of helicopters. Such as access to areas that are hard to reach, particularly for the purpose of rescuing. Another image that will excite your kid, the moment he sees it, is the helicopter in action. Here you will see a helicopter soaring across the sky in a straight line. The image is a powerful representation of advanced technology and the liberty that comes with it. Every child jumps in glee the moment he is told of cartoons. This image shall surely boost his mood and encourage him to color with full attention. The picture is surely exciting to look at but comprises of different elements that need to be colored with precision. So you have to help him there. This image might take some time to finish since there is so much involved in it. The image of a helicopter floating in the clouds surely looks adorable. It is quite easy to color at the same time. 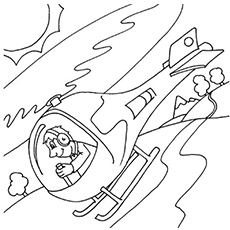 You can use the picture to tell your child about the difficult task of hovering which is carried out by the pilot. Also tell him that constant control is needed to offset the gusty air created. Once the coloring has been done, it could be cut out and added to a personal scrapbook. 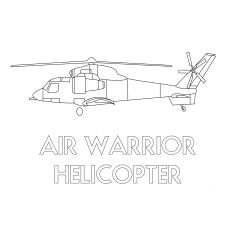 The warrior helicopter carries with it an element of danger and mystery. This image stands as a representation of war and military strength that were displayed during the Second World War. Tell your child about this historical event. The picture is quite distinct as compared to the rest. A very simple yet effective method you could use to teach your child about alphabets is this. Try to observe his creativity by letting him choose his own colors. Teach him the different names used for helicopters such as chopper. This picture will give your child the perfect view of a modern helicopter. 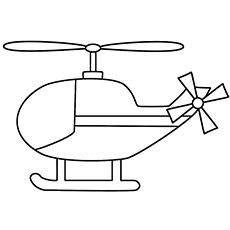 Use this image to tell your kid about the history of helicopters and that it actually came into existence in 1480. It’s the year when Leonardo Da Vinci designed a machine which looked something similar to a modern helicopter. The picture is a little complex so make sure you don’t run out of patience while he colors. 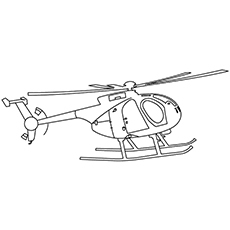 Did your child find these free printable helicopter coloring pages online interesting? 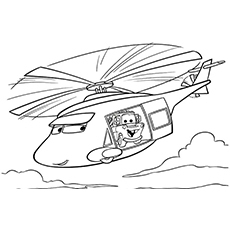 Please feel free to express your thoughts on these helicopter pictures to color to us.